Over Christmas there was a piece on the news saying that The Man was intent on recreating the Colossus of Rhodes. Once the inevitable questions were out of the way for e.g. "how can Greece afford such fripperies when its economy is well and truly in the shitter" and "why" I noted that it paled into insignificance behind the Scaryduck Great Five Year Plan for Weymouth involving giant statues of the Minogue sisters. This earned me a Funny Look from my brother-in-law. 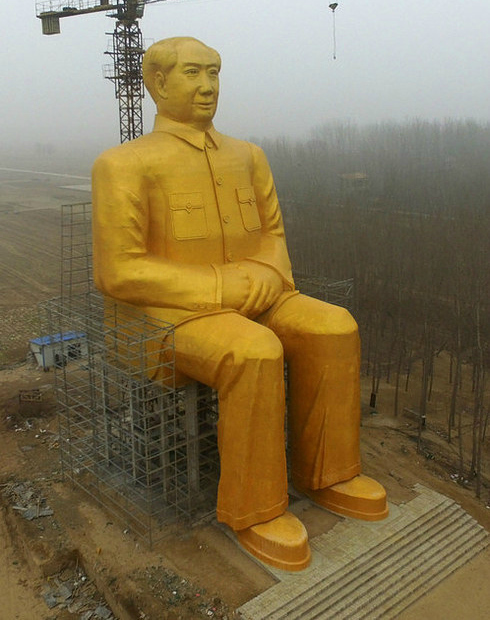 This statue is just as much of a Rubbish sh as the Colossus of Rhodes idea. Minogues ftw. The statue looks more like John Humphrys. It does beg the question of what's inside his golden trousers? Golden balls, perhaps? 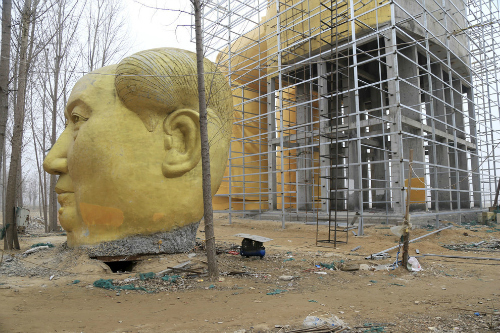 The constructors failed to get correct planning permission and the statue is in the process of demolition. They think it's all over. It is Mao.